Mild and snowy white, sweet, tender, and light textured. From the pristine waters of Alaska. Snow Crab is packed in its own juicy flavor that will enhance any steak dinner for a delectable surf & turf meal to satisfy the masses. 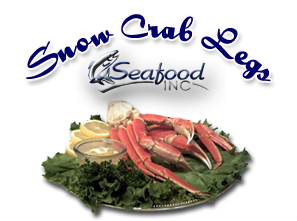 If you are catering an intimate affair Snow Crab has a very delicate and flavorful taste to entice the romantic side of anyone. Its fragile snow white meat is the perfect accent to any main entrée. Impress your friends and family with your ability to make them a fabulous Snow Crab dinner that they will be asking for again and again. The beauty of Snow Crab can be found in its snow white meat as well as in the fact it is low in fat and calories yet maintaining a high percentage of protein for your family. We package our Snow Crab in a resilient pouch to protect the quality so it may be delivered to you in its absolute freshness for your indulgence.